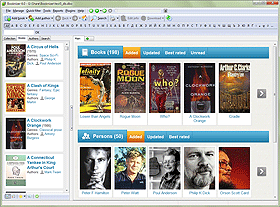 Booknizer™ is a powerful library organizer for books in any format. The program works with paper, electronic (EPUB, MOBI, PRC, PDF, FB2) and audio books (MP3, M4b, WMA etc.). Booknizer will synchronize electronic books between your computer and e-book reader device (like Amazon Kindle, Barnes&Noble Nook, Sony Reader, etc.). You can simply scan folders containing your e-books with Booknizer, connect your e-book reader to the computer and easily select books that you want to copy to the device. Booknizer is also capable of converting some e-book formats to a format supported by your device. Booknizer will show the exact location of any book and help you sort your library by the required parameters. For example, select all books of a certain genre and sort them by their rating. Or just show all books in German. The book organizer displays a book cover, a summary, genres, the publishing year, as well as your own rating and comments. Now you do not need to search your shelves for a certain book just to remind yourself of its plot. Click the name of an author in Booknizer, and the program will display all books of the author available in your library. Need more information? Click the "Download" button. Booknizer will download bibliography of the author, his or her photos and a biography.